In the early morning hours of April 13th 1995, we lost our brother firefighter Herlof “Ted” Hansen in the line of duty. 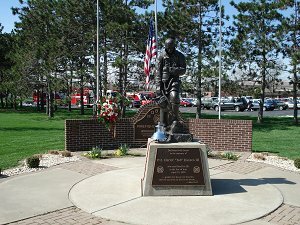 This memorial was erected in his honor, and is located in front of Fire Station #1, at 401 E. 10th St.
Teddy will always be in our hearts and minds, so long as we protect the citizens of Hobart. Please visit the National Fallen Firefighters Foundation website.